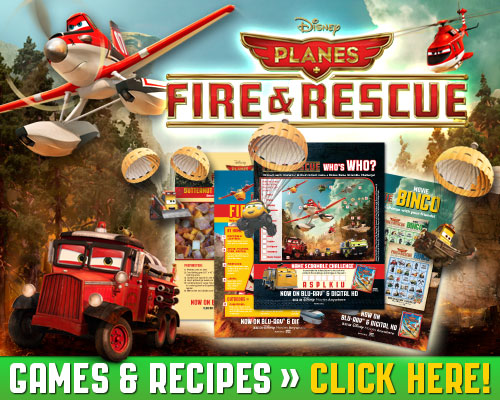 Disney’s Planes: Fire & Rescue has flown into retail stores! What better way to celebrate this release than with a free activity package featuring your favorite Planes Fire and Rescue characters! ~Learn how to make a sweet butternut squash apple bake with the included fantastic recipe. ~Get some fire prevention safety tips, a must for any inspiring young Fire Fighter. ~Play Who’s Who? with your favorite Planes characters including Maru, Ryker, Mayday, Avalanche, Drip, Dusty, Dynamite, Blackout, Pinecone, Cabbie, Lil Dipper, Windlifter, and Blade Ranger. ~Play Planes: Fire & Rescue Movie Bingo with all your favorite characters and take advantage of the free spots. To download this awesome package, click the image below and save the pdf to your computer. It is free to download, print, and create! Don’t forget to grab your copy of Planes: Fire and Rescue and bring home the Disney Magic!